For over forty years, the Monroe Symphony Orchestra has provided live, symphonic music of high artistic quality for the education and enjoyment of the people of Northeast Louisiana and the region. The Symphony’s goals have included collaboration with other local and regional arts groups, bringing artists of national reputation to the community, providing opportunities for recognition of talented, young, Louisiana artists and seeking to reach out into the community with concerts that appeal to all segments of the population. The Monroe Symphony Orchestra, founded in 1971, was organized as a community orchestra. The subscription season, presented from October through May, consists of classical concerts, pops concerts, and a family concert. The MSO also presents Sound Safari, an educational concert offered to third, fourth, and fifth graders. As a viable and highly visible part of the arts community, the MSO also contributes to the cultural development of northeast Louisiana by bringing notable conductors and artists of national and international renown to perform with the orchestra. During this 47th season, the MSO continues to bring the best of symphonic music to our community with its subscription series. A Membership provides season subscribers with a package of 5 concerts and membership levels are available at many price points. Clay Couturiaux is entering his fourteenth season as Music Director and Conductor of the Monroe Symphony Orchestra. In service to the orchestra, Maestro Couturiaux works successfully to increase the annual budget, inspire the musicians to perform with outstanding artistic integrity, and offer the most interesting pops, standard, and contemporary programming to the patrons. Dr. Couturiaux has accumulated over twenty years of experience conducting professional symphony orchestras and teaching at the university level. His career has taken him across the United States, Europe, and Asia including concerts with the Ho Chi Minh City Symphony Orchestra, Milano Classica Orchestra da Camera, and National Taiwan Normal University Symphony Orchestra. Other professional conducting engagements include performances with the Abilene Philharmonic, Arkansas Symphony, Austin Symphony, Metropolitan Classical Ballet, East Texas Symphony Orchestra, Texas Chamber Orchestra, and Wichita Falls Symphony Orchestra. 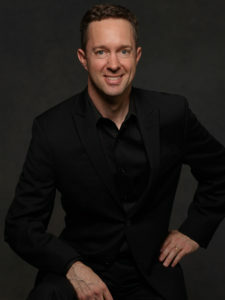 As Assistant Director of Orchestral Studies at the University of North Texas, Dr. Couturiaux teaches fundamentals of conducting technique, advanced orchestral conducting, and is conductor of the UNT Concert Orchestra. He has also recorded with the UNT Chamber Orchestra on the Crystal Records label. In March 2013 the Northeast Louisiana Arts Council named Dr. Couturiaux the recipient of the Edmund Williamson Artist of the Year Award. The award is presented to an artist who the selection committee feels has made the most significant contribution to the improvement of the quality of life for northeast Louisiana. He lives in the Denton, TX area with his wife Desiree Couturiaux and their two daughters, Addie and Ava. Craig West is the newly appointed Executive Director of the Monroe Symphony Orchestra. He has been active in music for much of his life, having taught choral music and music history in Texas public schools, as well as serving as minister of music in several churches. Dr. West graduated from Midwestern State University in Wichita Falls, Texas, with a Bachelors of Music Education, and from Southwestern Baptist Theological Seminary in Fort Worth, Texas (Masters of Christian Education), and New Orleans Baptist Theological Seminary in New Orleans, Louisiana (Doctor of Educational Ministry). He is excited to help the MSO move forward in the coming season!